« All aboard for Ticket to Ride Rails & Sails! 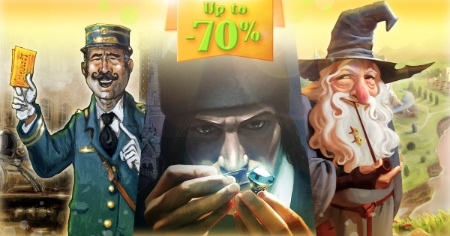 A bright summer opens with up to 70% off the digital versions of Ticket to Ride, Splendor and Small World 2! Enjoy our special Summer Sales with discounts* to entertain your relaxing sunny days! Get up to 70% off on all the digital adaptations of our board games, for your platform of choice! If you are a Steam user, get up to -50% on all our expansions as well! Wherever you are this summer, keep your favorite board games handy! (*) Discounts apply on selected packs and products only, can vary without prior notice from one item to another, one store to another, one country to another, and over time. Discounts are available during a very limited period of time. Promotions may not be available on some stores or some platforms. This entry was posted on Thursday, June 23rd, 2016 at 21:33 and is filed under Days of Wonder Online, Events, Games, News. You can follow any responses to this entry through the RSS 2.0 feed. Both comments and pings are currently closed. opened ticket to ride on android device and expansions are not on sale. am i missing something?